Extended standard weigh belt feeder (troughed belt) with discharge gate type 01.1, including water drainage, for allowing zero-setting, for repair purposes and simultaneous water drainage. Suitable for coarse-grained materials, e.g. gravel and crushed stones, ores, clinker, glass, etc. Extended standard weigh belt feeder (troughed or flat belt) with sealed gate type 08 for shut-off purposes allowing taring or repairs. Suitable for fine-grained materials, e.g. fillers, glass, etc. Extended, ruggedized heavy-duty weigh belt feeder with pin gate for shut-off purposes allowing repairs. Suitable for coarse-grained materials up to approx. 200 mm (8 inches), e.g. ores, or for feeding crushers or processing plants, etc. More than 50 years ago, WÖHWA developed the first weigh belt feeders for products with varying changes in flow characteristics and bulk density. All components and software for the modular designed weighing system are produced in-house at our factory. The modular design of the WÖHWA blending and reclaim weigh belt feeders allows an individual adaptation to on-site conditions while using standard components. Each blending device can be equipped with either a manual WÖHWA shut-off/sealed gate or an electric slide gate. An electric slide gate allows automatic zero-setting of the belt scale. 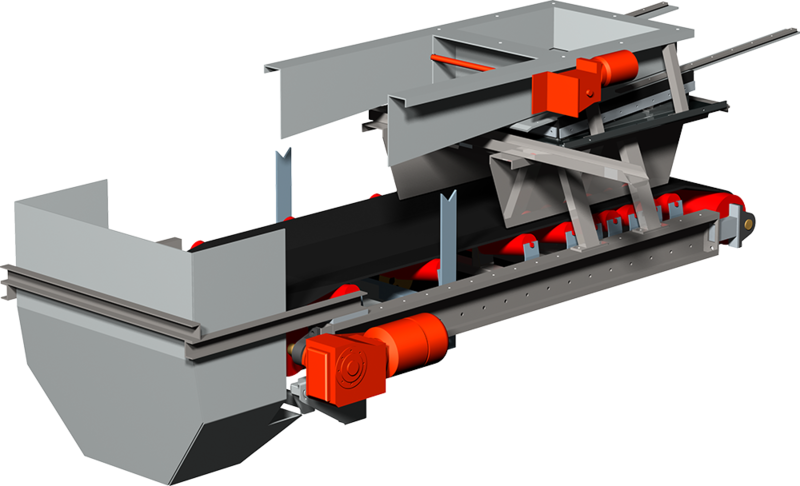 The robust blending/reclaim weigh belt feeders can be supplied with belt widths from 400 mm (16 inches) to 1,400 mm (56 inches) to meet all application-specific requirements in respect of flow rate, product or flow characteristics. All standard components are cut on our own laser cutting machine and then hot-dip galvanized. The weigh belt feeders can be supplied with troughed or flat belts. The well-designed construction protects the scale from any detrimental influences disturbing the high-accuracy weighing. Each weigh belt feeder can be adapted in length and width to meet any customers' specific requirements. Prior to commencement of manufacturing, plans in PDF or DWG formats will be submitted to the customer for final approval. Connecting flange and chute can be individually adapted to any customer application. The weigh belt feeder is equipped with a slip-on gear drive. The motor power rating is optimally selected for any specified blending/reclaim rate (special motor versions also available). Numerous options are available, such as dust covers, wear-resisting lining, water gutters, emergency-pull cords, sheet cover for reverse pulley, frequency converters, etc. All sensors are non-contacting. WÖHWA blending/reclaim weigh belt feeders can be easily combined with other WÖHWA components. Depending upon the application and product, the manual emergency shut-off gates, types 09 and 99, the pin gate, type 89, or the double-flange sealed gate, type 02, may be used as shut-off gates. The WÖHWA sealed gates, types 03 and 08.1 as well as the slide gates, type 01.1, can be supplied either with a motor or with only a hand-wheel. A combination of the various blending/reclaim feeders with the above listed gate types with opening widths ranging from 200 x 200 mm (8 x 8 inches) to 1,000 x 1,000 mm (40 x 40 inches) meets most flow rate requirements. The robust connection frame between slide gate and belt feeder prevents dust and dirt entering the slide mechanics. All slide gate components are freely accessible and can be changed without having to empty the stockpile or silo. The feed chute is mounted between connection frame and belt feeder and allows the forming of a material bed on the belt. The feed chute can be adapted to any customer application. Lined with 10 mm (0.39 inches) polyurethane reducing wear and noise. A constant belt tension increases the weighing accuracy. Maintenance-free, self-adjusting outer belt cleaner with rubber spring element for easy belt cleaning. The V-shaped inner belt cleaner prevents belt damage from material intruding between belt and reverse pulley. Each belt scale is supplied with a robust digital tachometer (wheel) for measuring the belt speed. Sensor and bearing are hermetically sealed to prevent contamination from dirt. All scales are pre-adjusted at factory and can easily be re-adjusted on site with the supplied test weight.